Yesterday, October 14, was a busy day. 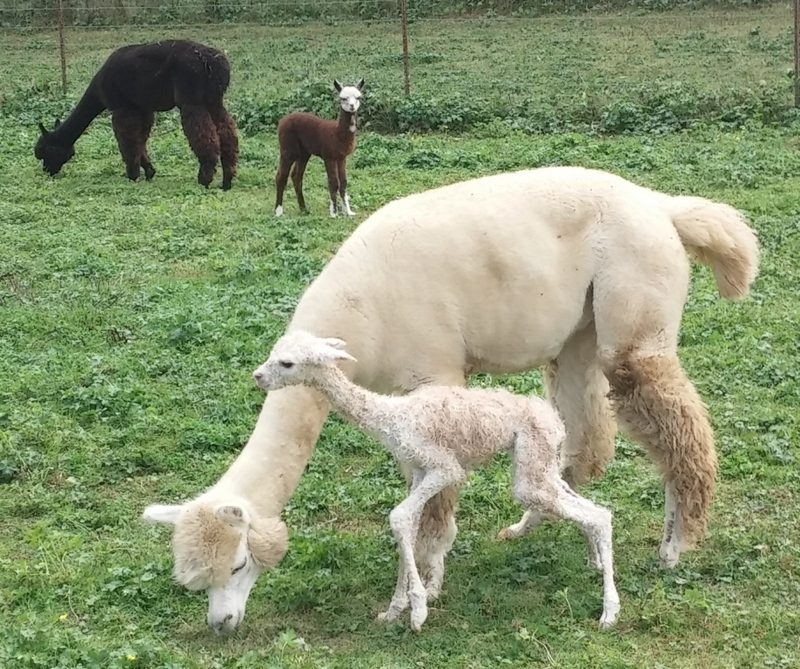 We were getting ready for a large storm headed our way, making sure all the alpacas had plenty of hay in the barn and sheds and that things were as clean and dry as could be after days of fog, when one of our girls due this week went into labor. Ima Joy has been acting ready to deliver for several days now, so we were not surprised to see her go into labor a little before noon. Her labor progressed normally, but took a little longer than the usual 15-20 minutes because Ima laid down and refused to stand back up, alpacas normally give birth standing up. We helped minimally by pulling gently on the crias legs (one at a time to help the shoulders pass through the birth canal in case they were stuck). 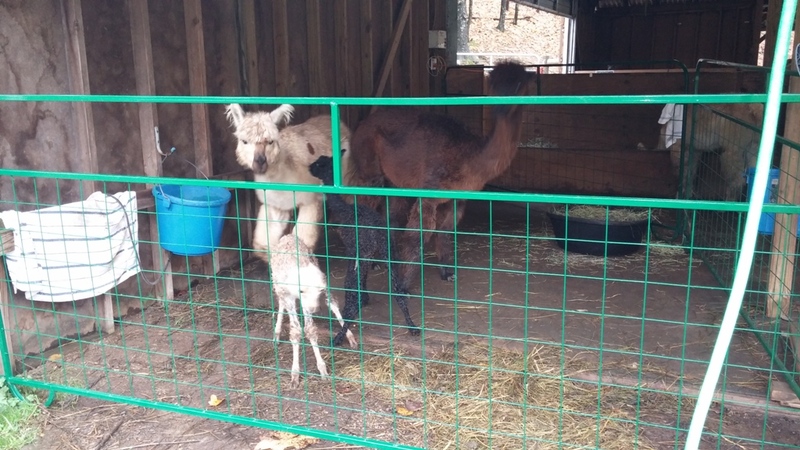 Everything went fine and the cria was ready to get on his feet as soon as he was born. What a beauty! He has beautiful spots in many colors. We suspect that we will find even more when we shear him for the first time next May as he has a dense fleece and much of the color is masked by the cria tips (whose color can be affected by the amniotic fluid during pregnancy). We have named this adorable boy after his parents, Peruvian Maximus and Ima Joy. Peaceful Heart’s Maximum Joy will go by the nickname MJ around the farm. 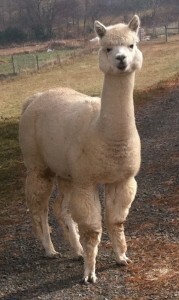 He is full of energy and running around the pasture today with Wade R., Hercules, and our second surprise of yesterday. MJ’s coloring is just a great example of the fun of alpaca color genetics. We never know what to expect. 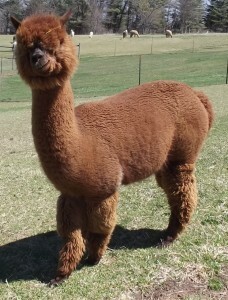 MJ’s full sibling Dante was born last year, and was such a pretty boy with lovely dense fleece that we decided to repeat the breeding. Despite having the same parents, Dante is a lovely solid beige in color, and MJ is a spotted wonder. When we got Ima and MJ settled in the barn within a pen to keep MJ from wandering out into the expected rain*, we headed back up to the store and found that Ruthie had delivered a beautiful little boy while we were busy. He was sitting up pretty as you please surrounded by his mom and the other girls in the pasture. She had even passed the placenta, our “no drama mama” (and most typical birth type on the farm). With the storm heading our way, we decided that Ruthie and her boy should join Ima and MJ, so picked him up and carried our newest farm member to the barn with his mom following close behind. We had not expected the other two girls in their pasture to get so upset, but they were worried about him leaving and running along the fence line trying to find him, so we opened the gate and let them follow too. We had a barn party, the two newest and their mamas in the pen and the pregnant girls and new mama and crias with them in the rest of the barn. Everybody was settled and ready for the storm which brought a lot of heavy rain overnight. We named our newest farm member Peaceful Heart’s Polar Night. 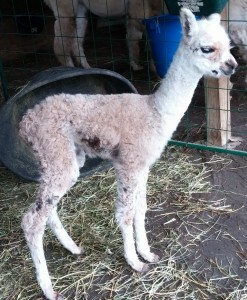 His parents are the lovely Henrietta Ruth, “Ruthie”, and fabulous Polar Ice. Night is a rich true black in color and as we sat around discussing name possibilities, we read that the opposite of the midnight sun phenomena at the poles is called polar night, when the night lasts for more than 24 hours in the polar circle. We thought it was a perfect name for our newest boy. 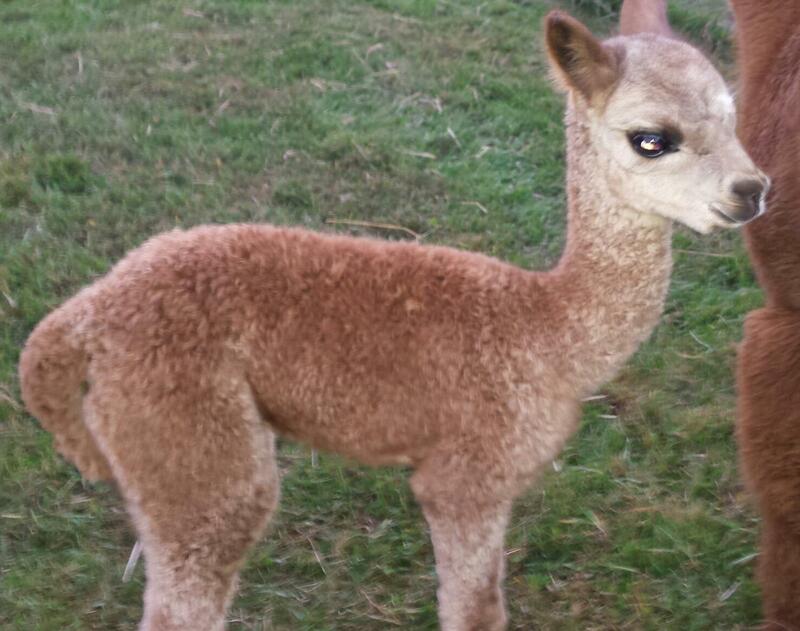 Night weighed 18 pounds at birth, and is also enjoying being out and about with the other crias today. We invite you to come out and watch them play this weekend. The weather is supposed to be sunny and the leaves are predicted to be at their peak colors. 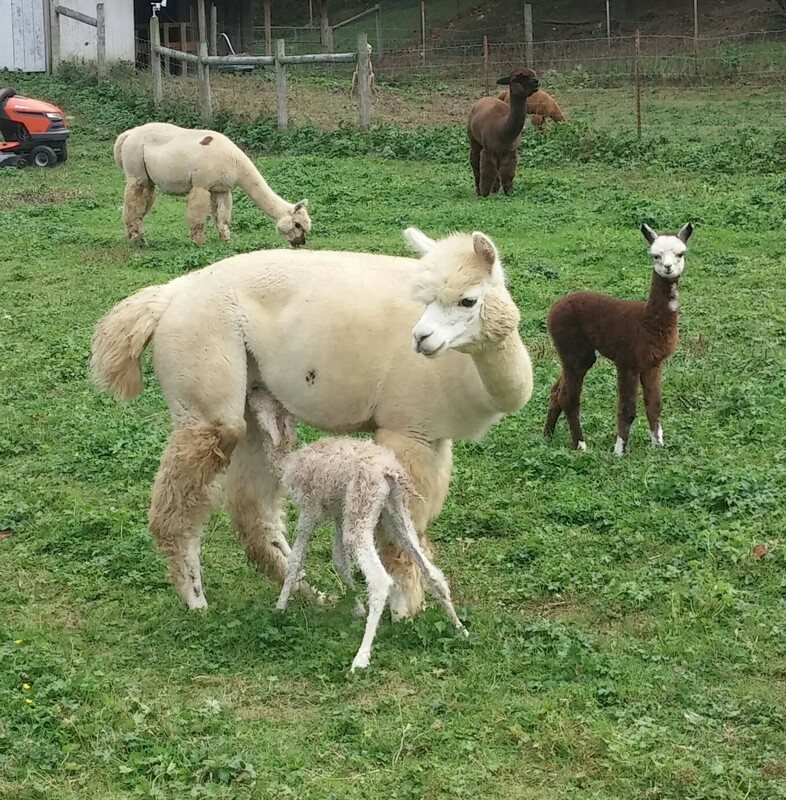 Come by the farm to see the alpacas and then enjoy some of the other fun things to do in the area, including the Blue Ridge Music Center, Blue Ridge Pumpkins, Mabry Mill, and Nancy’s Candy Company to name a few. We also have great places to eat nearby. 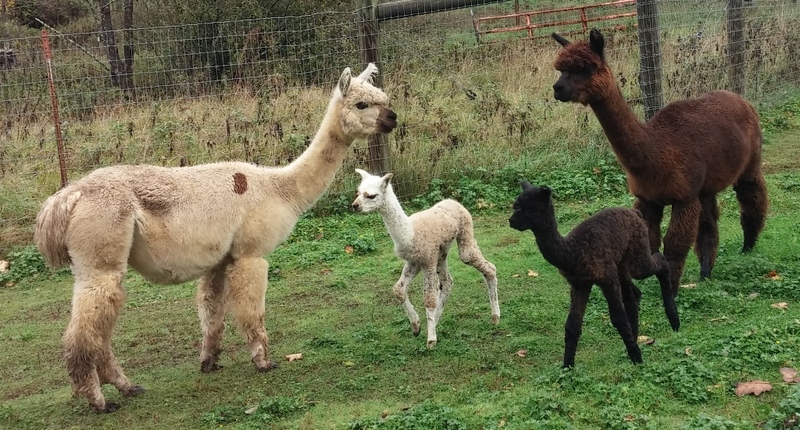 For those of you looking to begin or add to your alpaca herd, our Ready to Deliver Package is no longer available, but we still have a lot of other options. 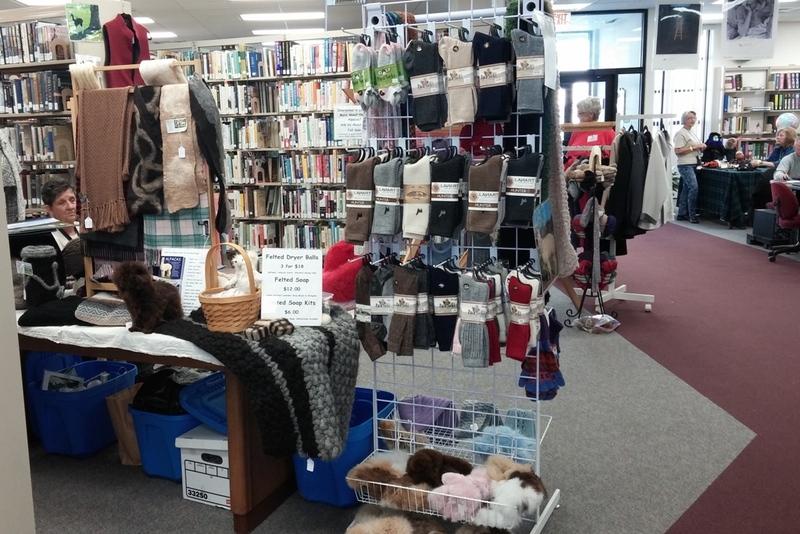 Talk with us today about creating your own special alpaca package. 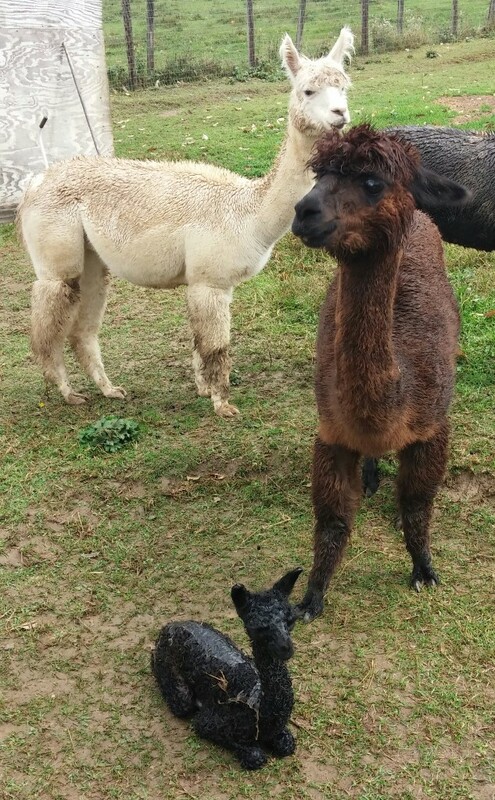 * In our experience, newborn alpaca crias don’t have enough sense to come in out of the rain, and in fact seem to have an unfortunate habit of settling out in the rain no matter how bad the storm. Within a few days, they have mastered following their mothers, so when a heavy rain starts they run to the barn with everyone else. After too many experiences of running out in storms to bring crias back under the shelter only to have them head outside again with their worried mothers close behind, I have decided that preventing the possibility is less stressful for all. 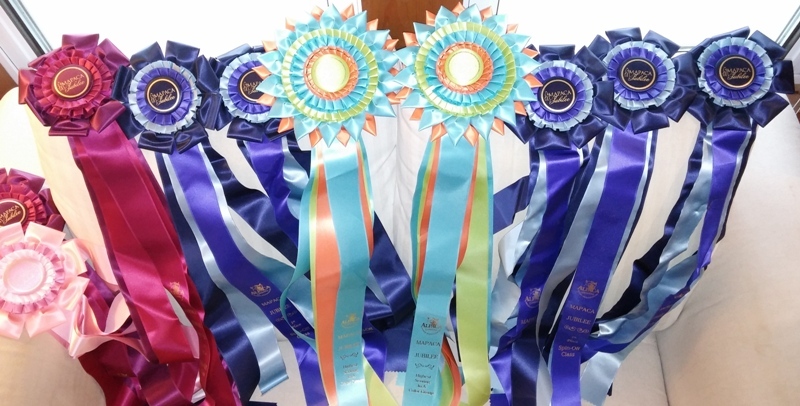 I am late in posting our 2014 MAPACA Spin-off Results, but I want to share them because we are so proud of how well our alpacas did in this very large show. 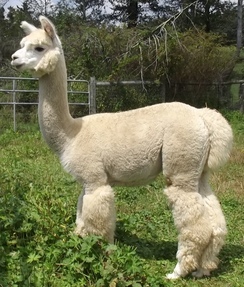 One hundred huacaya* alpacas entered the MAPACA Spin-off this year, 8 of which came from our farm. 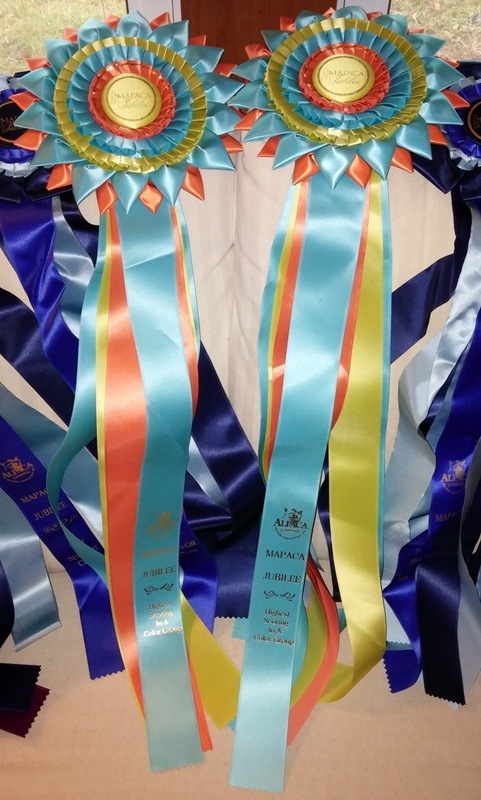 Our eight alpacas brought home 10 ribbons to the farm, including 5 First Place and 2 Highest Scores in their color groups. First Place honors went to Sunspot, Shareen, June Delight, Bonnie Alice and Polar Ice. J Dubs and Gabriel brought home Second Place ribbons, and Lucky brought home a Fourth Place Ribbon. Our stars of this show are definitely Sunspot and Shareen. Both won Highest Score in their color groups in classes of 19 and 17 alpacas respectively. Shareen’s half brother Hyppogryff took home this same honor at MAPACA in 2012. 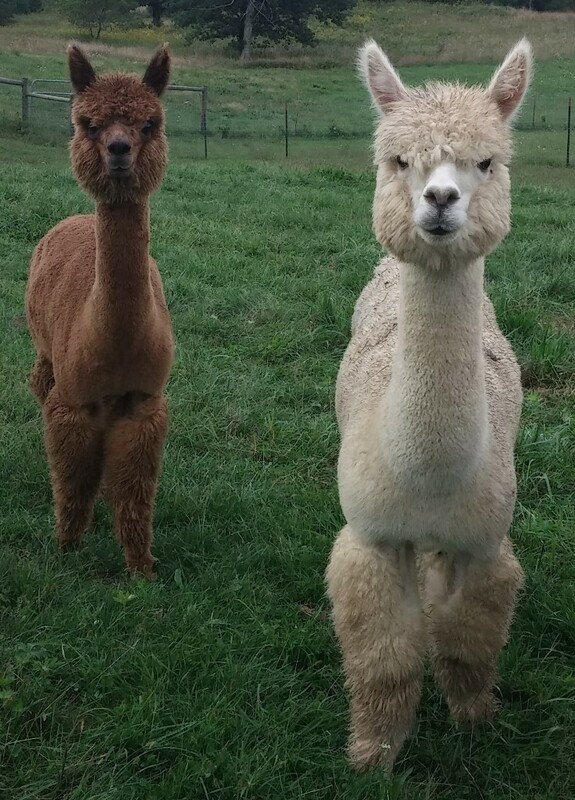 * There are two types of alpacas, huacayas and suris. We raise huacayas, who have a crimpy fleece that makes the alpacas look round and fluffy as their fleece grows out. The suris have a straight, silky fleece that hangs like dreadlocks as it grows out. New Alpaca Cria – It’s a Boy! Peaceful Heart’s Hercules was born the afternoon of October 6, 2014 to the beautiful Marquessa and our true black champion herdsire Maximus. 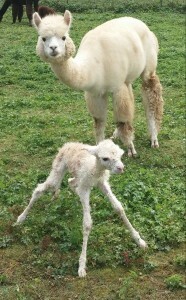 Hercules was on his feet quickly with his mama following him around the pasture. 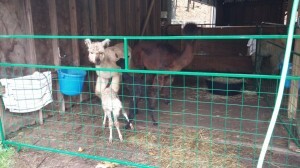 Our first fall cria, Wade R., who was 8 days old today is fascinated by the new cria, but also a little intimidated. Wade is not quite sure what to think of Hercules, but I suspect they will be playing together soon. Wade kept a close watch on Hercules as he was first getting around. Hercules has some great siblings. Last year Marquessa gave birth to a fabulous little boy named Marcus who just moved off the farm to join another farm as a junior herdsire. 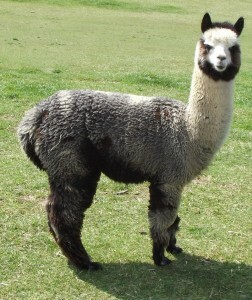 His sire Maximus has given us five fantastic crias in a variety of colors from beige to black. 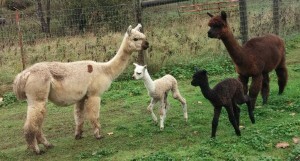 We are expecting several more crias this spring, including from three fabulous girls now available for sale. We hope you can come by the farm and see our two sweet new boys soon. 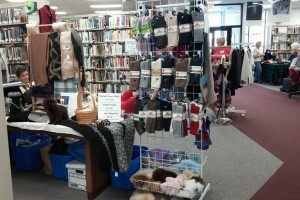 Saturday, October 4th, we had a wonderful time at the Clifton Forge Heritage Day. They had a great celebration with wonderful music, food, and traditional artisans. Many of the artists were displaying at their School of the Arts. 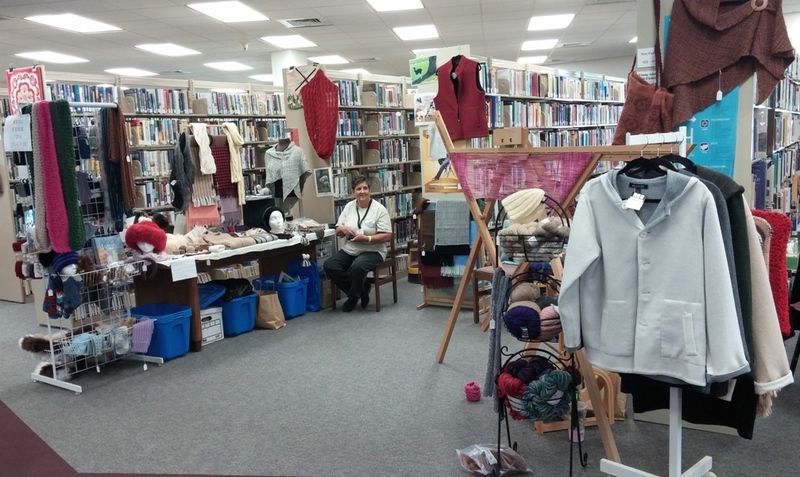 We were set up in the library with some talented quilters and doll makers. 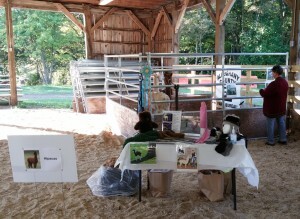 We had a great time meeting new people and talking about alpacas. We also demonstrated weaving on the triangle loom and spinning. This week we had the opportunity to participate in an agricultural field day for 4th graders of Alleghany County, NC. They had a wonderful full day program allowing the kids the chance to see farm animals up close and talk with farmers about chickens, cows, pigs, goats, sheep and alpacas. Each class moved around to the different stations and spent about 10 minutes at each station learning about the animals and asking questions. 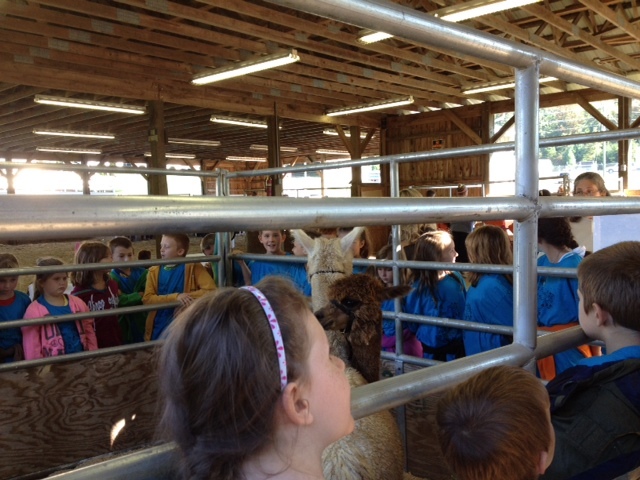 Butch Cassidy and Augustine represented our farm well as the kids were able to gather around and see them up close. 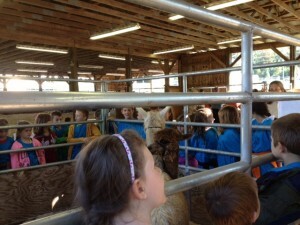 The children had great questions and paid close attention to the alpaca boys. Butch Cassidy kept up a running commentary of hums, which the kids enjoyed responding to in unison. Augustine was curious and greeted several of the kids with a quick nose touch. We had a fun time talking with the kids about raising alpacas, letting them touch the fleece we brought from this year’s shearing, seeing some of the beautiful things we make from our alpacas’ fleece, and demonstrating spinning. Congratulations to Mackenzie’s Meadow Farm on the addition of two fabulous alpaca girls to their farm and the birth of a brand new alpaca cria. 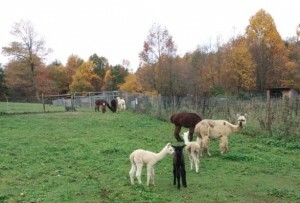 Autumn Breeze and Angelica joined the other alpacas of this growing alpaca farm, including several alpacas originally from our farm. 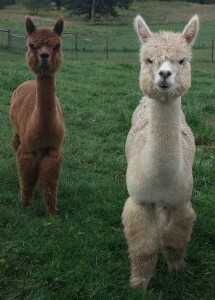 Autumn Breeze and Angelica are both out of the fabulous Snowmass Casanova’s Arch Angel. Their mom’s Bonnie Alice and Ima Joy have been excellent moms on our farm, and I know their daughters will carry on their great tradition. Autumn Breeze also just gave birth to a fabulous little boy out of Polar Ice. He has dense fleece like his parents in a beautiful fawn color. We are happy to be able to help Mackenzie’s Meadow Farm as they are building their foundation herd. Give us a call if we can help you choose the right alpacas to start or grow your farm. Our fall alpaca sale is still going on, so take a look at our alpacas for sale and give us a call to set up a time to come meet them.